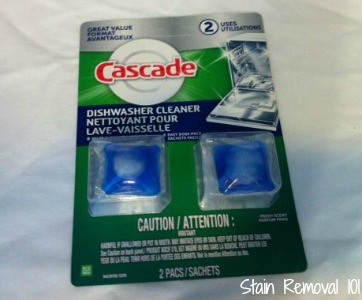 Cascade Dishwasher Cleaner Review: These Pacs Are Great! 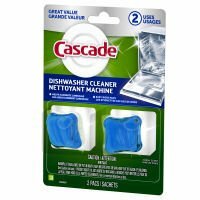 I recently used a couple of Cascade dishwasher cleaner pacs, and I have to say I'm quite impressed. I found a pack of two at my local Walmart, and I was very interested in trying them since they looked like they'd easily dissolve like they're supposed to, unlike some of these darn bottles of cleaner with the wax seals that just don't seem to work in my dishwasher. I wasn't expecting much, but was pleasantly surprised. You need to use this product when your dishwasher is empty, which is one of the biggest challenges for my family, since as soon as we run one load there is always stuff to be added when we unload the clean load. When you've got an empty dishwasher all you do is take out one of the packs, place it in your detergent dispenser, and start the cleaning cycle. Easy peasy. I did notice that while it was in use the product created quite a powerful (but not unpleasant) smell while the machine was running, throughout the whole kitchen and downstairs of my home, and this scent then lingered for several days inside the machine itself. I am not as sensitive to smells that are in cleaning products as I am to those in laundry products, but if you don't like strong smells, it would be best to avoid this product. of my dishwasher after using the first pack, and I went ahead and used the second as well (running the machine a second time) to get even more benefit since my machine was getting pretty grimy. What I like about this product is that it attacks both types of soil that often accumulate in your dishwasher -- limescale and grease. As I explained in a previous review, I still think the Lemishine Machine Cleaner (click the link for my review) is still the best for removing hard water build up, but the Cascade packs are probably my second favorite product for doing this. Several of the dishwasher cleaners don't even address this mineral build up, which is in my opinion, quite silly since it is a very common problem. I also like that the Cascade version also attacks grease and soap build up in the machine, which can also be a problem over time. I think I might begin alternating the LemiShine and this product in my dishwasher for cleaning it, since the Cascade packs attack the grease better, in my opinion. Overall, I was happy with the way this product worked, and would definitely use it again. Has anyone else used this product? If so, I'd love to hear your experiences with it as well, either positive or negative. You can either submit your own review or check out even more reviews of these cleaners from various brands to find the perfect one for your home. Definitely cleans the dishwasher, but the smell is very strong, both during the cleaning cycle and for many normal cycles afterwards. I am concerned about the product's safety, since many dishwasher loads afterwards with "clean" dishes still smelled terrible. I will never use this product again, and will find alternatives. Thanks for sharing your experience with this product Jeff. I agree, the smell is quite strong, and I really wish they'd cut back, significantly, on the perfume they use in the little packets. Has anyone else used this product for cleaning their dishwasher? I'd love to hear from you too. You can share your reviews here of this or any other dishwasher cleaner telling me how it worked for you. Whose idea was to to put Gain in dish soap? It makes the dishes and glasses taste and smell like perfume it was horrible. I used this product and the smell is extremely strong. My dishes are left with a very strong odor which has not come out after several washings. I may have to throw out my plastic cups and buy new ones because they smell terrible. I will never buy this again and threw out the remaining packet. This stuff was waaayy too much scent. It's still in the dishwasher after several washes. I have to leave the dishwasher open for while before I unload. Even after that I leave the plastic glasses out on the counter for a while before stacking, and the glass glasses top up in the cabinet, to let the smell go away. I threw the second packet out, and will never use this stuff again. I agree, very strong smell. While not unpleasant, it ruined a load of plastic dishes and my travel cup. Will not purchase again. I tried this dishwasher cleaner, and it was one of the worst experiences ever! The smell gave us all headaches, made our sinuses burn, and could be smelled outside in our garage (on the other side of the house). Had to air the house out for over 10 hours to be able to go into the kitchen. I've tried repeatedly to get the smell out of the dishwasher, but it still has the same sickening sweet perfume odor. Reviews I've read (back to 2014) of the product said that the smell ruins plastic washed in the dishwasher & even somehow leaves a residue or something on glass that they can taste & smell when using the dishes. Some people say they ended up having to get a new dishwasher. I have no idea what to do to get rid of the smell. Bleach, lemon, vinegar, baking soda - none of them have helped. I've always trusted Cascade products, and have to wonder why the company continues to make something that so many people have complained about. I definitely won't try that again. I purchased this dishwasher cleaner because I thought Cascade had a good reputation. What are they thinking? This is the worst cleaning product I have ever used. The strong perfume odor is so obnoxious and is not going away. I called the customer service number to see if there was a way to get rid of the smell that attaches itself to my dishes & glassware. I was told to run vinegar in the machine. I tried this with no success for 2 weeks & the smell still lingers. I have to rinse the items taken out of the dishwasher with hot water to remove the smell. Looks like I will have to go back to washing by hand until I buy a new washer or figure out a way to get the strong perfume smell out. Very discouraged!